There are two erroneous assumptions about America's future that seem to be popular these days. The first is that America has given up its role as a world manufacturer because we've lost the entrepreneurial spirit and ability to innovate. The second is that high tech capabilities are the strict domain of the big, well monied corporations. Walk in the door of Bill and Judy Zivko's company, Zivko Aeronautics, Inc, on Guthrie Municipal northeast of Oklahoma City and you find yourself standing in the middle of what made America great in the first place; The small business entrepreneur who is showing up the big guys by doing more with less. By combining common sense with elbow grease and applying high tech where it does the most good, they are forging themselves into the type of company that is bound to survive the 90's while many larger, better funded companies may not. They are a small specialty house that produces not only the newest, hottest aerobatic monoplane in the business, but have developed a composite capability that is increasingly being called on by aerospace corporations to do the prototype work they can't do themselves economically. Bill Zivko is an excellent study in how sport aviation technical fall-out is reaching past EAA-oriented markets to effect other parts of the economy, as well. Bill is often mistaken as being extremely quite. Maybe even a little shy. But what people don't realize is that he isn't just being quiet. He is listening. He is soaking up what's around him and learning. If he has one characteristic, that's probably the dominate one. He always appears to be learning. Some time in the late 1960's Bill decided working for a Wisconsin FBO wasn't taking him where he wanted to go. An AI, he didn't want to look down the road at his future and see an endless string of annual inspections with an occasional radio installation here and there. He wanted something with more excitement and colour. He found it in Newton, Kansas with a guy named Jim Bede. At that time Bede was up to his neck in the famous BD-5 project and Zivko lent his talented hand in building up the mini-jets. The BD-5J. Since that day Zivko has never completely gotten away from the little jets. He worked with Bobby Bishop for years maintaining his airshow 5J and today still works with Leo Loudenslager on the Bud Lite Airforce's little kero-burner. Bill wound up back in Wisconsin after the demise of the Bede project, but several years later received a phone call from another Bede alumnus, Burt Rutan, who asked Zivko to come work with him at Scaled Composites. They were just building up a head of steam to begin the Beech Starship project and Rutan needed people who knew how to get things done in a shop environment. Bill moved his family to the high desert of Mojave and he became shop manager for Scaled Composites. If he was looking for exciting projects, he was certainly in the right place. Although Zivko's primary background had originally been in traditional aircraft materials, he was little by little moving deeper into the composites. By the time he left Scaled Composites in the mid 1980's he recognized the advantages of the materials and continued working with them in his own business. Bill and Judy spent a number of years in the Oklahoma City area before deciding to relocate their shop into a brand new hangar/shop/office complex on the Guthrie airport. At that stage of the game they were already going in two directions at once, one of which came about from their friendship with the late Tom Jones, a well known aerobatic competitor and airshow pilot. It was through Jones they were exposed to the ever changing arena of unlimited aerobatic competition. The high-G world of unlimited aerobatics was proving too much for the Stephens/Lazer type monoplane wings. Even though the wood wings used railroad-tie spars, they were delaminating and actually breaking. Even with all the mods worked into the wings by pilots such as Leo Loudenslager, the wing was still too marginal. It was a safety item they all worried about. Besides being a safety item, getting wood of high enough quality and long enough to make the 24 foot spar wasn't easy and was becoming increasingly expensive. Zivko looked at the wing and immediately saw an application for composites. He knew he could build a stronger, lighter wing and at the same time update the aerodynamics. The reason he had such confidence in himself was he had a cadre of friends, courtesy of his time with Scaled Composites and other similar projects, who were at the forefront of composites design and engineering. Using input from pilots like Jones and Loudenslager, Zivko made up a list of factors that had to be primary design parameters. Those at the top included high roll rate, low stall speed and extremely high strength. Bill knew pilots were pilots. They didn't want to worry about all that mechanical stuff. They wanted to pull and not worry about it. 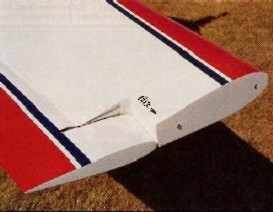 Since 10 G's wasn't unusual in an unlimited sequence, Bill decided his Lazer replacement wing would have a safety factor of two, giving the wing a 20 G ultimate. At that number he felt safe. The final design combined some of the industry's best. John Roncz designed a new airfoil that would have a low stall speed, would corner well and have predictable, well-behaved characteristics at both ends of the envelope. 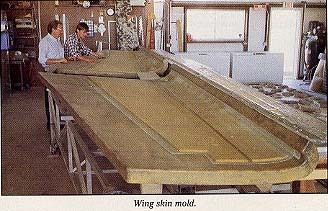 The preliminary wing layout was done by Paul Finn, while Dave Boldenow, a Boeing composite engineer, did the structures. When the prototype popped out of the oven, Zivko loaded it to 20 g's and found a deflection of only a little over four inches. Now that's stiff! The production wing weights 224 pounds and is good for 20 Gs, versus the old wooden 12 G wing that usually weights around 250 pounds. The wing was first installed on Joe Olson's Lazer with many more following right on the heels of that one. Zivko Aeronautic's wing, the Edge ZA-1 is earning a reputation for giving the Lazer a new lease on life. In fact, Livko even began custom building airframe components for customers who wanted their own airplane that incorporated the wing along with a bunch of other modifications engineered by Zivko. They call their four-cylinder airplane the Edge 360. Unfortunately, unlimited competition has very definitely become an area where last year's model just won't cut it. Laser's can't make the grade, if nothing else, because they don't have enough power. Every year the factories and specialty shops keep cranking out new designs that climb and roll faster while combining handling that varies from stunningly well balanced to flat-out wierd. Unfortunately, those airplanes at the top of the aerobatic ladder aren't wearing Made in America stickers. They are also carrying more horsepower than can possibly put stuffed into a Lazer sized monoplane. And then there are their staggering price tags. Bill and Judy looked at the track record being established by their wing and decided the next obvious move was to build their own high performance airplane around that wing. They wanted an airplane that could successfully bump heads with Sukhois and Extras. That meant going to a six cylinder, I0-540 in place of the Lazer's 0-360. There are lots of places in everyone's mechanical life where the only logical solution for a situation is a healthy dose of cubic inches. Or a bigger hammer. By the time Zivko Aeronautics was getting ready to start into their own airplane project, they were already a production shop which had a client list including names like Tinker Air Force base, Leo Loudenslager and a most interesting client named Aurora Flight Sciences. Aurora's products were ultra-high altitude, unmanned aircraft which were aimed at doing all sorts of environmental surveying up where manned aircraft were nearly useless. These aircraft were designed to work between 80,000 and 100,000 feet while carrying payloads that sniffed the atmosphere for bad stuff or could loiter on top a hurricane for most of its life cycle. They measure their loiter times in days, not hours! The current production aircraft, the Perseus B has a loiter time that can be extended up to four complete days. They can do global-scale chemistry surveys over nearly half the earth's circumference in one flight. Obviously these airplanes are special purpose and rely on light weight and long wings to do their thing. And that's where Zivko Aeronautics comes into the picture. The huge (59 foot) wings wouldn't be possible without composites and Zivko built not only the wings, but all composite components including the tail and fuselage as well. There are a lot of composite fabrication companies in the world that could build the components, so it says something that Zivko aced-out many much larger companies. With their moves into the big time world of composite engineering, a full-time engineer, Todd Morse (his great grandfather invented the code), was added to the staff along with complete CADCAM capabilities. All of this experience and capabilities were brought to bear on their unlimited bird, the EDGE 540. The heart of any aerobatic airplane is the wing, which in this case is probably one of the most carefully designed and manufactured wings in the country. Zivko prides itself in quality control and details. They go so far as using raw materials that each carry their own verified certifications which are kept on file for each component made. Each lay-up has its own sign-up sheet so it can be verified later that it was laid-up at a given angle, done by a specific individual and signed off as being correct by an inspector. Every single step from the manufacturing of the raw materials to the final paint coat is carefully documented and inspected. The skin itself is glass with a foam core stabilizing the skin. The ribs are Nomex filled, carbon fibre layups and the spars are mostly carbon fibre. The layups are done in a clean room that doubles as a paint booth and curing is done in Zivko's own 26 foot long oven. The fuselage is relatively traditional, having evolved from the Lazer with careful attention paid to those areas where several decades of competition have revealed weak points. This is another area in which Zivko took advantage of those experts who know what works and what doesn't. They carefully documented the histories of performers and competitors who are flying similar types of tubing structures and noted where they were having problems. Then they sat down with their own computers and proceeded to design an entirely new fuselage which hopefully eliminated all those problems. Although the fuselage looks to be a Lazer derivative, it is actually a completely new, computer designed structure. Next in their development program will be replacing the wire-braced empennage with a completely composite unit. 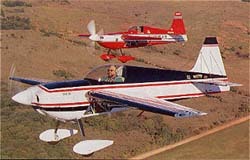 Weight, weight and weight are the first three factors constantly nagging at the mind of any aerobatic designer. Lowering the weight is the same as gaining free horsepower and in competition, every ounce counts. In the case of the Edge 540, the quest for ever-lower weight brought composites into play in many areas other than primary structures. Practically every external fairing which would normally be made of aluminium is carbon fibre. This includes the turtle deck, canopy frame and even the instrument panel. The cowling, complete with nose bowl and all fasteners barely weights 12 pounds which shows the concept does work. The super slick and tight fitting canopy frame doesn't have a bolt or screw showing because the canopy, as well as all Plexiglas panels, is all bonded in place rather than being bolted. This makes for light, rigid installations that can be replaced by simply sanding the back of the mounting flange away and bonding in a new piece. The engine in the EDGE 540 we flew was powered by a mildly tuned Monte Barrett, parallel valve IO-540 pushing about 310 hp (dyno verified) into the air via an MT three-blade. In the Edge 540 kits or finished aircraft, the propeller of choice would be a three-blade, composite Hartzell. The net result of all their attention to detail is an unlimited aerobatic airplane with a 20 G wing that, in the case of the example we flew, barely weights 1170 pounds. 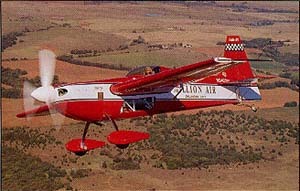 With a normal aerobatic weight of 1527 pounds, that puts the power loading at under 5 lbs/hp. No wonder it is such a rocketship! The price of a complete kit, minus the usual engine and all other kit stuff that isn't usually included, is $57,052, which includes every single option including having the wing pre-mounted to the fuselage and all tubing finished, painted and pre-oiled. This also includes the wing tank option that gives an additional 33 gallons over the 19 gallons in the fuselage tank. Zivko stresses that even though they've done much of the work there is still a fair amount of work to be done by a builder. They view their kit as being half way between a plans-built airplane and a true, ready-to-assemble kit. Incidentally, of the total price, $18,995 is for the basic wing which can also be fitted to your old Lazer fuselage, should you have an extra one laying around. Mark Pfiefler, an airshow performer and professional pilot from the Oklahoma City area not only loaned us his airplane for the pilot report, but did the flying during the photo session. He showed a tremendous amount of patience and self control in hiding his apprehension at having someone else fly his "baby", although those watching during the flight said he was pacing the ramp like an expectant father. Can't say as we blame him. A walk-around on the airplane shows the standard stuff expected of an unlimited airplane except you seldom see it done this well. The gaps at the back of the canopy combing, for instance, couldn't have been .025" and were absolutely even from one end to the other. Ditto the cowling or anywhere else anything came together. The turtle deck combing flowed down around the vertical fin and was finished with a neatly detailed little window that put the elevator horn in full view for pre-flighting. A nice touch! Saddling up, it became immediately obvious Mark had the cockpit tailored just for him and he is mostly legs. Long ones! Bill Zivko had to get in there with one of his guys and adjust the rudder pedals back so I could come even close to getting full rudder. Locking the canopy down, I cranked the engine, paying particular attention to Mark's directions for a hot start. The big Lycoming caught on the third time around and showed no indication of stumbling when the mixture went in. 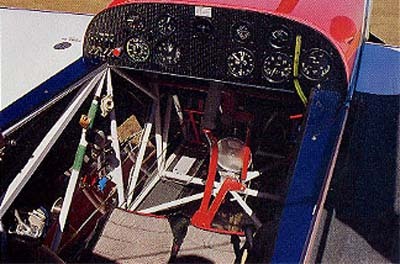 The Haig locking tailwheel was controlled by a plastic coated cable stretched back from the vertical piece of tubing just under the throttle. Hook a finger around the cable and pull and the tailwheel was full swivelling. Leave the cable alone and the wheel was locked straight forward. It was a nice, fool proof arrangement, although I still prefer steerable tailwheels. As I lined up on the runway centreline, I was pleased to see I could see. Unless you've flown some of the mid-wing monoplanes with the low canopies you don't realize how blind the pilot is. The wing usually covers most of the pavement. The Zivko 540 is a long ways from being a C-172 in the visibility department, but it's not nearly as blind as some of the other unlimited. I had enough of the 75 foot wide Guthrie runway in sight I relaxed. Until that point I had been really worried about the landing. Now I was only apprehensive. The takeoff wasn't so much a takeoff as it was a cat shot off a concrete deck. One second I was beginning to move the throttle and the next I was clocking 100 knots and going up at an angle that has to be seen to be believed. Everything about the experience was immediate. The engine spooled up the instant the throttle moved and the airplane reacted just as instantaneously. Left hand moving forward, airplane moving easily twice that fast, runway flashing past, brain telling my right hand to be gentle in bringing the tail up and the long hand on the altimeter started flashing in a circle. By the time we were off the ground and I glanced inside, the airspeed was blasting past 110 knots and it was all I could do to keep it down to 120. Actually, I was well out of the pattern before I realized the airspeed was in knots, not mph, otherwise I would have pulled the nose into an even more ridiculously steep attitude to keep it down. As it was, I timed the rate of descent at something over 3,500 fpm. Now that calls for exclamation marks! The instant the gear left the ground I could feel the ailerons in my hand. I don't mean I could feel the airplane moving, I mean I felt the ailerons, as if their trailing edges were nested in my palm and I could sense their tiniest movement and the airplane instantly reacted. This is not an airplane for those of heavy hand. But, even at that early stage I could tell the stick ratio was long enough the airplane didn't feel twitchy. As quickly as the airplane responds to a control input of any kind it would have been easy for the airplane to have been like trying to balance on a bongo board (those things where you try to stand on a board balanced on a roller). The stick ratios eliminate that feeling almost completely. Al though the perceived pressures might as well be zero, they are so light, the stick has to move far enough that the pilot has total control and is able to really fine tune his movements. It also didn't have any breakout forces to speak of, in any direction. In fact, a minute or so later when levelling out at 4,000 feet, I was treated to a unique control feel. It was unique because all stick force gradients were perfectly flat. Perfectly flat. The forces in any direction didn't seem to change at all regardless of how far I displaced the stick. In pulling "G", the stick force felt the same all the way through. The pressure at full aileron deflection was the same as barely starting a turn. The pressures also didn't change with speed. It was hard to get full aileron deflection because the airplane whipped around so fast, that by the time you could get the stick up against a knee the airplane would already be right side up. The roll rate has been timed at 420 degrees, which is enough to blur the horizon. This is especially true in doing vertical rolls. I've never been especially good in the vertical, but it goes around so fast you're into the second one before you know you've come close to finishing the first one. Does it stop while rolling? On my first vertical I thought I'd do a quick half roll to see how it felt. Blur! Twitch the stick back the other way to stop and my head bumped the side of the canopy as the airplane slammed to a halt. Crisp is hardly the word for it! A lot of airplanes that have light control pressures in pitch will be asymmetric in their behaviour. They'll be light when positive but it takes a healthy arm to get much negative G on the airplane. This is absolutely not the case with the Edge, it comes as close to being the same outside as inside as any I've seen. It takes a little more arm, but only a little and just a touch of trim lets it fly hands off inverted. This made manoeuvres like rolling 360's a whole lot less work. The way the airplane handled when slow is at least as impressive as how it handled the fast stuff. Pulling out of the tops of verticals, I was being ginger, just letting it zero G its way over. The big engine let me do anything at that point because I was purely ballistic, just a passenger behind a whirling MT. At one point I bought the power back while pulling over the top at zero speed waiting to see what it would do. It didn't do anything. It kept on pulling. At least twice I found myself messing around at speeds around 30 mph, full back stick and still flying around the corner because I was low on G. Then I got down just over stall and honked into a hard corner trying to stall it. It would buffet a little but not do anything unusual. Then I'd unload, hit the power and go shooting straight ahead like out of a sling shot. Coming out of a slow speed situation, it acts as if it has JATO bottles. Incidentally, a couple of times I played with the power while going vertical down hill to see what the prop would do. I pulled the power all the way back and even though I was pointed straight down, the prop would flatten out, airplane would slow down and I'd slide forward into the straps. Later, while shooting landings, I got a kick out of the way the big prop acted like a spoiler. Just a touch of power would keep the blades from flattening out, but pull the power and it acted like drag chute. The first flight of any airplane is a tentative meeting of friends, you circle around one another trying to figure out the best approach. That's why a second meeting is always a must. You've had time to think about the first meeting and you've got all sorts of ideas about the second. 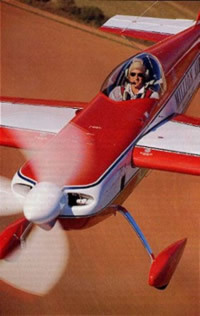 Unfortunately, I only had time for one flight in the EDGE 540 which is no way to judge an unlimited aerobatic airplane. Assuming, that is, I was capable of judging it in the first place, which I'm not. I doubt if there are 25 pilots in the entire world capable of truly saying how well the airplane stacks up against the unlimited hot dogs and I'm not one of them. 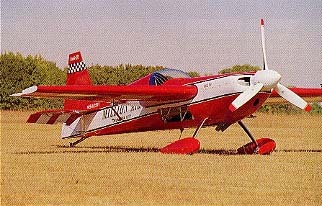 Judging from the tapes I've seen of Kirby Chambless flying his Edge 540 at Fond du Lac, there seems to be little doubt the airplane can do some amazing stuff, including hovering at zero airspeed. It would be nice to see something like the Edge make a serious mark for itself. It's American born and bred and comes out of a small shop tended to by loving hands. In a wildly three-dimensional sort of way, the Edge 540 and Zivko Aeronautics represent the best of the American spirit. Get an idea and make it happen! And that's exactly what the Zivkos are doing.